The i-Lift Equipment 2200 LB universal plate clamp has 0-0.79" jaw opening, perfect for lift and moving heavy plates. i-lift Equipment and its group factories specialize in the field of Material Handling & Lifting products with significant worldwide presence. i-Lift is dedicated to innovation, quality and service. Not designed to use on stainless steel or aluminum plates. For use only with materials with a surface hardness below HRC 30 (HB 300, Brinel 1300). If you have any questions about this product by i-Lift Equipment, contact us by completing and submitting the form below. If you are looking for a specif part number, please include it with your message. 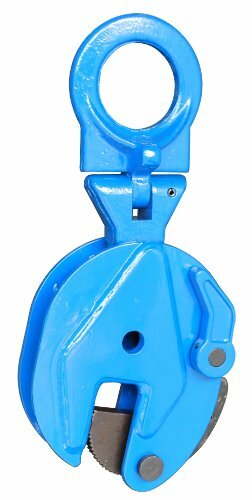 American Drill Bushing SHR-23051 Safety-Engineered Swivel Hoist Ring ADB Hoist Ring, Load=800 lbs.